Last Friday I was up at BETT 2018, so no Friday Focus that week. It was an interesting show, as ever, but as usual there was an awful lot of hype - mostly about VR. Highlights for me? The people I had a chance to meet and discuss ideas with. Nice to see Mark Anderson (the ICT Evangelist) and Michael Forshaw (Innovate my School), as well as Dr Sarah Younie and her colleagues from De Montfort University. Also made it to the launch of the EDUCATE programme, which promises to "bring together entrepreneurs and innovators, with academics, researchers and educators, to deliver world-class EdTech products and services". High hopes for that programme, might even get involved myself. This week it's back to the usual Friday Focus though, and this time around I've decided to talk about an app called Seesaw. It's doing really well in the US, but I think not quite as well known over here in the UK. It's well worth taking a look at if you're interested in student portfolios. 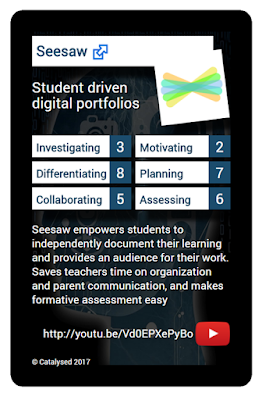 At its heart Seesaw is about allowing students to create digital portfolios. They have their own journal where they can add photos, videos, drawings, files, notes or links. What makes it a bit more special is that it takes advantage of the way in which digital technologies can break the rules of space and time, and hence allow other people to see their work in pretty much real time. That means that you as a teacher can keep an eye on student thinking, but also that content can be shared with parents or other carers, plus it can also be shared with the other students in the class. This can create a vibrant online space, with lots of opportunities for peer feedback, constructive criticism and celebrations of good work. In addition to the basic journal teachers can also structure learning directly by adding activities for students to engage in. There are a bunch of them already built into the app, such as "Explain an Idea" or "Sketch your Goals", and the great thing from a teachers perspective is that they come ready to run straight out of the box, with instructions to help children get started. Everything is automated for you, so you get notifications when things have been added, and you can set it up so that content only goes live if you approve it. There's lots more under the hood for Seesaw, including private messaging, commenting, folders, and even skill progress monitoring (in the paid version I should add), but the nice thing is it is relatively easy to get something up and running with your class that's effective very quickly, and push on to more advanced use as and when you and your class are ready. As you can imagine Seesaw is very good for planning, both from your perspective as a teacher but also from the students perspective, as it allows for structuring your content, reminding students of activities, informing large groups simultaneously, and a whole lot more planning type tasks. It's also pretty handy for assessing, as you can keep abreast of a large body of student work with one simple interface, and provide tailored and contextual feedback as appropriate. What it scores highest on though, according to the Tech Trump card above, is Differentiating - so that's what I'm going to talk about here. 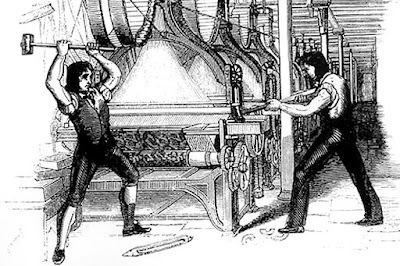 The notion of digital technologies supporting differentiation is all about how they can be 'protean'. Now I know that's a bit of an odd word, but I use it because it's become associated with edtech in the academic literature, and sometimes it's important to use the correct language if you want to transfer the correct meaning. By protean I'm using the definition of being "able to do many different things; versatile". That's important in differentiation because at the heart of differentiating in the classroom is, well, difference! The myriad ways in which students can articulate their thinking, using audio, video, graphics, etc. gives students the flexibility to say things in their own way. Now I'm not going to start going on about learning styles, as we all know by now (don't we?) that support for that idea is pretty much non-existent, but that doesn't mean that you can't let students use different ways in which to express their knowledge. Not only will their choices support differentiation by process, as they will have to make different decisions based on their media choice on how they will structure and organise thinking, but it will also support differentiation by product, as what students will produce can be widely different depending on how they've gone about the task you set. Now I'm aware that this type of differentiated approach can be difficult to assess, but then again - who needs summative assessment? Formative assessment is more powerful, and you can even get the students themselves to use the tools built into Seesaw to evaluate and comment on each other's contributions. You can also use audio commenting, which again can help those who might otherwise shy away from writing to engage with the overall learning process. So that's about it for Seesaw - an excellent way of introducing student portfolios into your classroom, and utilising the power of digital technologies as a catalyst for differentiation. Do you have any ideas for using Seesaw that you'd like to share? Please feel free to add them in the comments. Looking for more edtech? 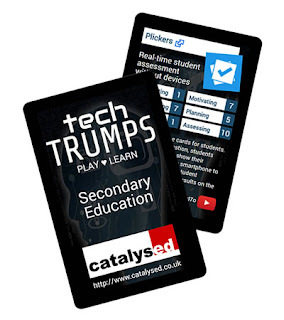 Head over to http://techtrumps.co.uk to see Seesaw and a host of other apps for teachers. You can also buy your own pack of cards direct from Amazon.co.uk - and this week I'm having a half term special, so they're only £6.99! With your own pack of cards you can browse at your leisure, or play a game with your colleagues. Have fun, and discover new apps at the same time!